September is upon us, which means that it’s time to roll up your beach towel, embrace the influx of students around Beantown, and begin the countdown until it’s socially acceptable to consume pumpkin spice lattes all day. To shake up your September routine a bit, we’re offering exclusive $10 tickets to Sh*t-faced Shakespeare, all month long! So bring along a friend (or four), and prepare for an unforgettable night of theater, laughs, and various Sh*t-faced antics. 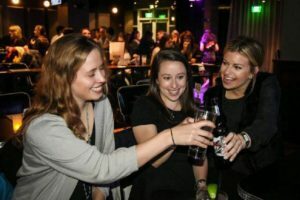 Whether you’re new to this whole Sh*t-faced thing, or you’ve enjoyed your fair share of nights at Sh*t-faced Shakespeare, here’s our ultimate guide for making the most of your evening! Because you can’t truly LOL on an empty stomach, we recommend a pre-show dinner on the town! If you’re heading to Romeo and Juliet in Somerville, visit Out of the Blue, a casual Italian seafood spot that “does it right”. It’s just down the street from the theater, and your taste buds will thank you. 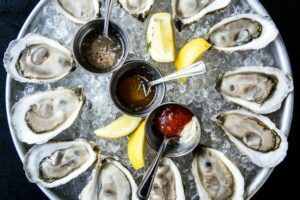 If you’re catching Much Ado About Nothing, head to nearby Row 34 for a perfect pre-show meal of oysters and beer. You might want to get one or two drinks in before the show! If Davis Square is your vibe, grab a pint at The Burren, a beloved Irish pub with an extensive menu. 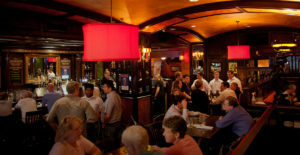 If you’re seeing Much Ado About Nothing in the Seaport District, spend an hour at M.J. O’Connor’s. This Irish pub has got you covered on drinks, from sangria to Stella. Everyone at Sh*t-faced Shakespeare is there to have a blast; you’re bound to be in the presence of cool, like-minded LOL-seekers. You can find some new friends (and get more followers on Instagram) just by enjoying your night at the theater to the fullest. You’ve got to document your epic night out with some selfies, of course. From your delicious dinner, to your pre-show drinks, to before and after the show, there are plenty of great photo ops throughout the evening. The key to Sh*t-faced Shakespeare is to just have fun! If you’re frustrated at work, just bombed a test, or simply need a break from the real world, a night of laughter is the best way to take your mind off of stress. Tell us about your night at Sh*t-faced Shakespeare on Twitter and Instagram!